Well known Iranian actor and director, Ramin Parchami, arrested during the 14th Feb protests appeared in court today. According to human rights sources reports inside Iran, Ramin Parchami was handcuffed and with a long beard looking thin and poorly surrounded by several security agents during his court appearance today. 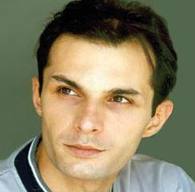 Ramin Parchami is a graduate of drama school from Azad university in acting and directing. Again, the Nazi's burnt books, but the Islamic Republic persecutes artists and poets! Still, with the ever growing louder voices against Assad in Syria, an anti-Isreali platform is no longer the guaeenteed excuse for ANY mafia style state government! Therefore the day the likes of Ramin Parchami are allowed to express their voice's by totally walking free in Iran, will also be the day that Zionist brutality is also put into it's proper place. Islamic hatred, bigotry, hypocrisy and picking up the resistance sword is NO longer the way... The decades if not the centuries have proved it! Secular democracy from all the surrounding Arab and Persian regions is the only TRUE way to put shame and pressure onto zionist zealots! Think about it: Khamenei exists by inflicting oppressive fear and fear mongering! Isn't it therefore about time that Iranian people found their own up-rising voice again? After all, what's it to be? A modern progressive democracy emerging in the middle east? Or just a 15th century theocracy spreading and supressing further expressions and freedoms? If Iranian's truely want a change, then it's no good just standing by - watching and resting on your laurels. Don't wait until the middle eastern protests pan out and see where they go? Add your OWN true true voice for democracy and change NOW!